Since when I was young I've alwais been attracted by drawing and painting. This vocation has lead me to obtain the first degree in painting, and in the year 2000 to complete my training with the two years' specialization school by the Fine Arts Academy in Bologna. Since then I've been working as a professional painter: my orkshop is located in Pieve di Cento (Bologna, Italy), the little town in wich I live. 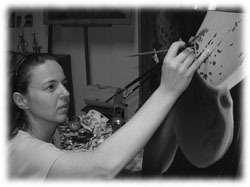 Here I realize portraits and paintings, and design wall and floor decorations to be realized with various tecniques: pencils, oils, achrilics, varnish and other materials. I like to be free to space between a classic ichonography and contemporary style experimentations.The mission of my professional activity is to satisfy the costumer through a tailor made service, based on his/her needs, taste and personal inclinations. Therefore I pay much attention to the developement of the first drafts, focusing precisely the customer's desires. The research thorugh materials and applications has lead me to realize a particular decoration tecnique, which combines resins and painting. The idea, from a raw level, has been developed in a standard named PITTUSINA (patent pending). You can have a look about it here. I'm absolutely convinced that decoration and painting have to be based on a solid knowledge of tradition and contemporary art and tecniques: being an experteese is the only way to realize a good final result from a good initial idea.